Formerly dropped by a virulent arachnid in the Plane of Nightmare, but now the loot tables seem to have been corrected. Dropped off a pile of bile on 3/3/18 on second kill, LOL, Sorry guys. Dropped off a pile of bile on 1/15/2018. Not broken as post below might indicate - dropped after approximately 50 kills of green oozes. Just very rare and frustrating to camp, as there are not more than 5-6 green oozes up at a time. I'm up the hundreds killed. I have been here for days doing this 8 hours a day. It's my last piece, so I'm showing some dedication (or stupidity). As a Ranger, I can track to keep my time down as well ~ but NOTHING. It hasn't dropped yet. If I get it to drop, I will post ~ but I'm not leaving any time soon! Just got it on my 60th ooze and bile kill combined. Dropped on a bile. I have been killing the piles of bile and festering pile of goo for 2 days and according to my logs I have over 100 kills. Not ONE dropped. Anybody else having this issue? 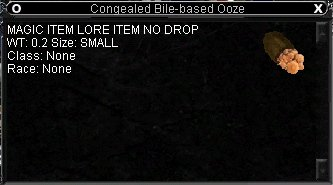 Killed 42 of 'a pile of bile' in my logs and have gotten 1 drop. Killed 40 of 'a festering pile of goo' in my logs and have gotten ZERO drop. Visit www.eqforever.com for my EQ blog and posts. For me, this was the worst part of the quest by far. It didn't really take that long, about an hour of killing stuff, but you have to kill crap basically in the middle of POD cause that's where the piles spawn that drop this, but you will get SO many adds if you fight anywhere but the boundaries of the zone. Even pulling stuff to the side can easily generate adds. It wasn't hard to kill the stuff as everything was green or LB to my 67 Monk, but I had to keep cleric merc out cause many times I would end up facing 3-4+ mobs because of aggro. I got tired of it and started killing stuff where I saw it, but that seriously would generate add after add until I would have 7-8+ mobs on me and merc at a time. Don't know how many piles and festering piles I killed, probably about 15-20 total. Again, it wasn't extremely difficult or time consuming, but mostly just a pain in the *** compared to the other easier drops. pull to the bone wall. no adds. Unless the oozes spawn really close to the bone wall you are gonna get adds just pulling stuff from the center area to the wall. Pulling anything any reasonable amount of distance resulted in adds nearly every time for me. Also Drops Off "a festering pile of ooze"
was just clearing the oozes to get to pile of bile and was completely surprised to find it off a festering pile of ooze. Still drops. Took about 30 mins today just killed eveything around the middle of the map in the hope more oozes would spawn. By the ooze river. Antonius Bayle, Long live the Euro Server! can anyone confirm that this still drops off a pile of bile? i have been killing these for days now without the congealed bile-based ooze dropping. Killed well over 500 pile of bile and still no drop. I am going till I get one. Let you know. and it won't. It doesn't drop from spiders anymore. Had 3 drop in an hour and a half of soloing with a 65 ranger. So what does this drop off of? This drops off a Virulent Arachnid. The common belief is that they screwed up they drops since creeping silk strands happen to drop from oozes in PoD.